3 Beds 3 Baths 1 Partial Bath 1,881 Sq. ft.
Adorable zero lot line with open flexible floor plan. Updated 2 the max-front & patio doors, engineered wood floors, carpet & fixtures! Front Home Office or Formal Room. Living area with natural light 2-story ceiling & wall of windows, plantation shutters & solar screens. Oversized Master is up with sitting area. Cute 2nd Bedroom would make great office or playroom with bay window & adorable shutters that can be opened to view downstairs living area. Kitchen boasts granite counters, stone backsplash, large pantry, bar, built in desk & oversized dining with fashionable crystal-style chandelier. AC & ductwork 2016, roof 2015. Back flagstone patio & pathway added 2017. 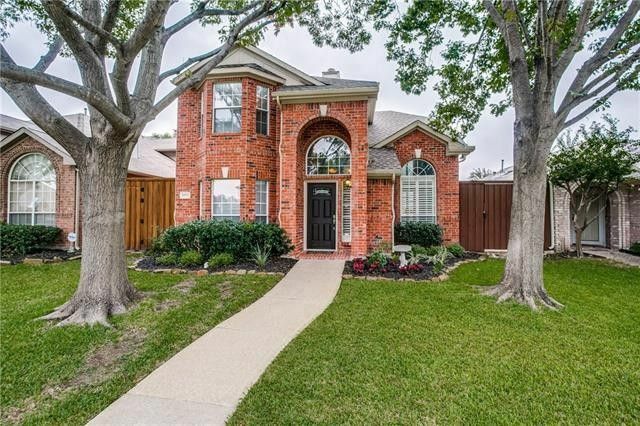 Close to park, playground & Chisholm Trail. Directions: The Trails is on SW Corner of Legacy and Independence in Plano. You can enter neighborhood from Legacy or Independence. Exclusions: Decorative mantel in Master Bedroom and Freestanding Fireplace Screen in Living Room.